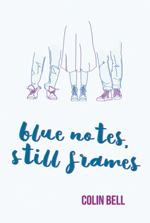 Colin Bell transports us back to Brighton in 1994 for his second novel Blue Notes, Still Frames, with a full cast of characters drawn together through the music and photography of the title. Busker Joe lives on the beach with his flute and his troubled Goth girlfriend, Victoria, who’s a singer. He borrows a bath towel for her from Rachel and Alan, a prosperous young couple from the rapidly growing world of computers. The meeting will change all their lives… and other lives too. 'While Stephen chills into the 60s, the ghosts of the past keep interest alive until a tense, and unexpected, denouement.’ John McGowan, Viva Lewes. Dr Michael Petry, Director of MOCA, London, Huffington Post.